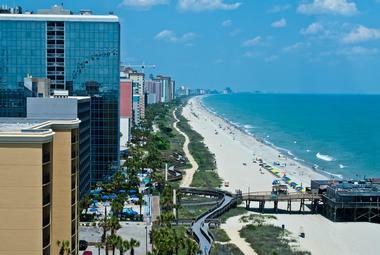 Myrtle Beach is a popular place to visit and summer is the best time to visit. 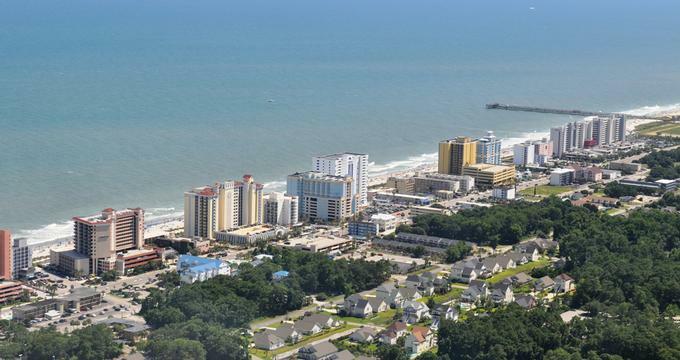 The weather is very sunny from early spring through late fall, but the months between June and August are the best time to visit Myrtle Beach for enjoying the beach. There are occasional rain showers in the summer, especially during July, and these usually occur in the afternoon. Spring and fall are also good times to visit because of the sunny days with their blue skies. The temperatures are generally warm and hotel room rates are slightly less expensive from March to May. Autumn sees lower room rates but also cooler temperatures. January is the coldest month of the year in Myrtle Beach with the average high temperature barely hitting 57°F (14°C). The average low temperature is a frigid 34°F (1°C). The snowfall average is close to 0 inches (1 cm). In February the average high temperature increases slightly to 61°F (16°C) alongside the average low temperature which gets bumped up to 37°F (3°C). As the climate rises, the snowfall average dwindle further to less than 1 cm. Myrtle Beach Weather in March: Spring comes to Myrtle Beach in March with the high temperature continuing to increase to 68°F (20°C). The low temperature goes up to 44°F (6°C), while precipitation levels average at 4 inches (102 mm). In April, spring continues to bring warmer weather to the area with the average low temperature and the average high temperature ranging between 51°F (11°C) and 76°F (24°C). May sees the upward trend in temperature continue as the low temperature climbs to 60°F (16°C) and the high temperature rises to 83°F (28°C). In June, Myrtle Beach sees an average of 5 inches (127 mm) of rainfall alongside the arrival of summer. The climate starts getting quite warm with the average high temperature and the average low temperature at 88°F (31°C) and 69°F (20°C) respectively. Myrtle Beach Weather in July: The hottest month of the year in Myrtle Beach is July when the average low temperature peaks at 72°F (22°C) and the average high temperature skyrockets to 91°F (33°C). August sees the highest precipitation rates of the year with rainfall averaging at 7 inches (178 mm). The high temperatures drop by a degree to 90°F (32°C) while the low temperature also sees a one-degree decrease to 71°F (22°C). In September, the temperatures see a significant decrease with the high temperature and low temperature measuring in at 85°F (29°C) and 65°F (19°C) respectively. Myrtle Beach Weather in October: By the time October rolls around, autumn is in full swing with the average high temperature taking a dip down to 77°F (25°C) and the average low temperature dropping to 54°F (12°C). November is the driest month of the year with precipitation rates averaging at 3 inches (76 mm). The low temperature and high temperature range between 45°F (7°C) and 69°F (21°C). In December, the first of the winter season’s snow begins to fall in Myrtle Beach with levels at about half an inch (1 cm). It’s also the second to the coldest month of the year with the average low temperature at 37°F (3°C) and the average high temperature at 60°F (16°C). The ultimate Myrtle Beach experience is best enjoyed from June through August. Despite the higher room rates and the increased volume in visitors, these months present the best weather in the year and promises that all attractions will be open. Festival goers eager to experience the Carolina Country Music Festival and more should also plan their visit between June and August. For warm temperatures with lower humidity and more affordable hotel rates, come between March and May. If you want to visit Myrtle Beach with no crowds or ant to get the best prices, plan your visit between September and October when the temperatures take a bit of a dip. The Myrtle Beach International Airport is just three miles southwest of downtown and is served by several airlines. There are several bus companies that bring tourists into Myrtle Beach: they are Greyhound and Southeastern Stages. The terminus in Myrtle Beach is just four blocks from the seafront. Buses arrive from Charleston via Georgetown. For train lovers, the closest train station to Myrtle Beach is in Florence, South Carolina. It is approximately 70 miles away from Myrtle beach, so it requires a shuttle, rented car, or bus to get from the train station to Myrtle Beach. Arriving by car is easy because Myrtle Beach is not far from I-95. There are several ways to get from the airport into Myrtle Beach. Car rental companies are located at the airport for those who want to travel to Myrtle Beach and possibly use the car to explore the area. There are also several forms of public transportation for visitors who prefer not to rent a car. Taxis are available just beyond the baggage claim area. Taking a shuttle from the airport into Myrtle Beach is another option. There are several shuttle services like the Myrtle Beach Airport Shuttle and limousine companies such as the Atlantic Coast Limousine Service. Coast RTA Bus Service is yet another option. 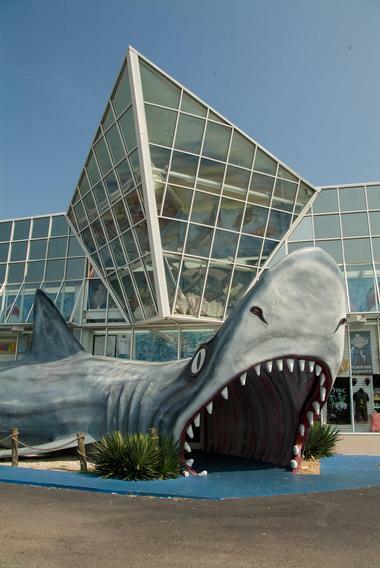 Myrtle Beach is blessed with three conveniently located tourist information centers. The first one is located at the airport so that visitors can get help with their stay as soon as they arrive at the airport. It is called the Airport Welcome Center, Myrtle Beach International Airport. The second center is the Main Office and Myrtle Beach Welcome Center located on North Oak Street. South Strand Welcome Center is the third tourist information center and is found on Highway 17 South, Murrells Inlet. All three locations offer maps, brochures, coupons, and event listings. Friendly staff members answer questions and give directions and suggestions. For those visitors who choose not to rent a car, The Coast RTA is a local public bus service that helps visitors get around the Myrtle Beach area. Referred to as “The Coast,” it is an affordable and convenient form of transportation for visitors to explore Myrtle Beach. 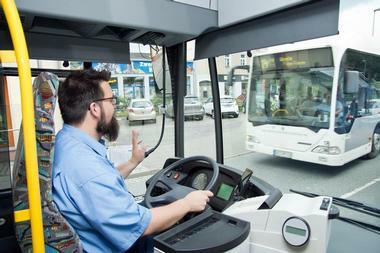 The bus system’s eight routes run along all of the major thoroughfares; there are 45 buses in the system that cover the most popular areas; and they run seven days a week. “The Coast” offers discounts to seniors and students. There are also unlimited day passes which are very affordable and make travel around Myrtle Beach very easy. Once visitors arrive in Myrtle Beach, they have several options on how to travel around the area. For people who plan to spend their time near their hotel and on the beach, walking is the best option. For those who want to explore the area beyond the beach, a car is a good choice. 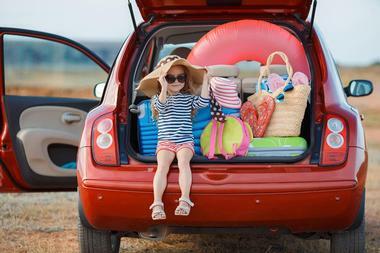 Cars can be rented at the airport or at agencies in Myrtle Beach. Using the services of a taxi is another option. They are easy to find although they can be expensive. The naming of streets is different in Myrtle Beach and North Myrtle Beach, so make sure the driver is clear as to your destination. Delicious cuisine awaits visitors to Myrtle Beach. 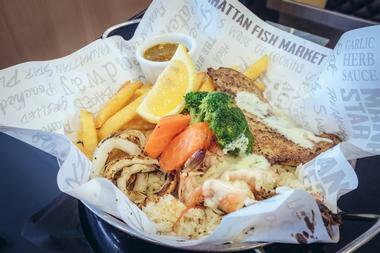 There is a wide variety of restaurants and eateries in the area. Seafood restaurant abound and serve fresh offerings caught earlier in the day: Myrtle Beach is known at the “seafood capital of South Carolina.” There are delis that serve light lunches for visitors who want to take a break from the sun on the beach. Gourmet restaurants serve steaks or offer buffets. Some restaurants are located on the waterfront and offer unforgettable views of the beach and the water. There are also affordable restaurants that serve tasty breakfasts, burgers, salads, nachos, vegetarian dishes, and ethnic cuisine. There are many reasons to visit Myrtle Beach and shopping is one of them: Myrtle Beach is a shopper’s delight! There are several large shopping malls and shopping centers, individual shops and department stores, discount factory outlets, high-end boutiques, specialty shops, and flea markets. At the Market Common, shoppers will find many upscale retail stores. Broadway at the Beach is a popular outdoor shopping complex where visitors can find interesting souvenirs among other things. There are two Tanger Outlet locations where bargain hunters will enjoy shopping at the many different name brand stores. There are plenty of shops selling beachwear, farmers’ markets, and unique gift shops. 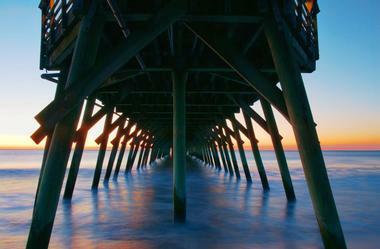 Myrtle Beach is the main attraction with its surf and sand. The beach is a public beach; it’s clean; and sometimes it can get quite crowded. There is no boardwalk so houses and hotels sit right on the sand. Broadway at the Beach is a neighborhood just two miles inland. One of the main attractions here is Ripley’s Aquarium with its Dangerous Reef exhibit. 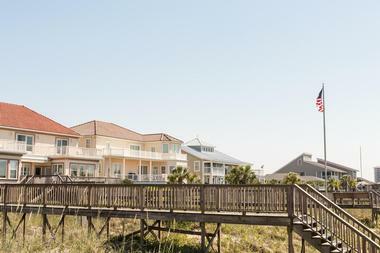 Located about 11 miles north of Myrtle Beach, North Myrtle Beach is a quiet residential area; however, it is home to many attractions like Barefoot Landing and the Alabama Theatre. Conway is 15 miles west of Myrtle Beach and features art studios and galleries, shops, and bistros. Myrtle Beach is a popular place for a romantic wedding with many venues from which to choose. You first need a South Carolina marriage license: marriage licenses from other states are not valid. There are several hotels and resorts that are good places for weddings because they can also cater your reception. Some of these include the Litchfield Beach and Golf Resort, Sea Watch Resort Myrtle Beach, and Marina Inn at Grande Dunes. 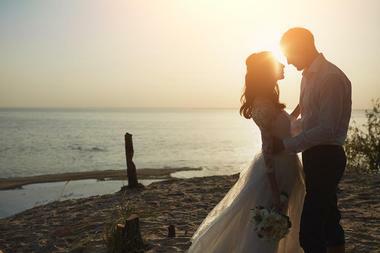 Other special venues include Brookgreen Gardens with its beautiful landscaping and sculptures; Pine Lakes Country Club with its ballroom; and, believe it or not, Ripley’s Aquarium is a popular venue for weddings. There is quite a range of accommodations available in Myrtle Beach. There are four luxury hotels including the Myrtle Beach Marriott Resort & Spa at Grand Dunes, and Marina Inn at Grand Dunes. Some hotels have indoor water features while others are known for being kid-friendly hotels or pet-friendly hotels. 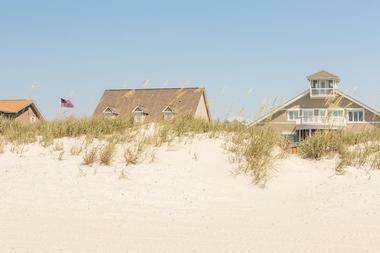 Visitors looking for an oceanfront hotel are in luck: most of the hotels in Myrtle Beach are on the beach. Some visitors book hotels near Broadway at the Beach because they are interested in seeing some of the major attractions in the area. 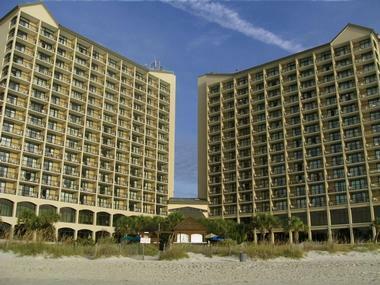 There are places to stay in Myrtle Beach to fit just about everybody’s budget.